Nearly 250 donors, friends, and leaders from throughout Wheeler’s history celebrated its 50th anniversary on September 29 and helped raise more than $145,000 for services, a record for fundraising events at the organization. The dinner and an ongoing Board of Trustee fundraising challenge for the anniversary year and event benefits a new fund at Wheeler that addresses a range of environmental and social factors that interfere with clients’ health and well-being, which are not addressed by other means of funding. Attendees included staff and leaders from every year of Wheeler’s history, two of the earliest trustees, and both the current and the founding leadership teams. The 2018 leadership team were the largest donors for the dinner, contributing to a collective group gift of nearly $20,000. Anthem Blue Cross Blue Shield, The Barnes Group and Loureiro Engineering Associates were also major sponsors, with all three organizations having deep connections to Wheeler through the decades. The full list of public sponsors is available below. Lieutenant Governor Nancy Wyman served as the dinner's honorary chair. In her remarks, President and Chief Executive Officer Susan Walkama, LCSW, praised the leaders, donors, and supporters who have guided Wheeler since 1968; unveiled a plaque of philanthropic supporters of Wheeler’s Family Health & Wellness Center in Hartford; announced a new significant gift from Lori and David Brantner in honor of longtime trustee Raymond Corsini; and showcased a 50th anniversary tribute video. 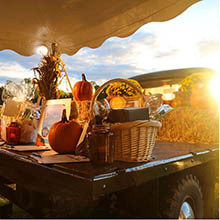 Celebrating 50 Years of Care: Wheeler’s Farm to Table Gathering was hosted by Rosedale Farms and Vineyards of Simsbury, with a Max Chef to Farm Dinner provided by the Max Restaurant Group. Rosedale Farms and Hanging Hills Brewing Company provided wine and beer, and The Meadows Brothers were the musical entertainment for the evening. Community health outreach workers connect patients with care and resources in the community. When longtime friend, Bill Torres, reached out to Chris Skelly eight years ago about becoming involved with Wheeler, she was open to his recommendation.